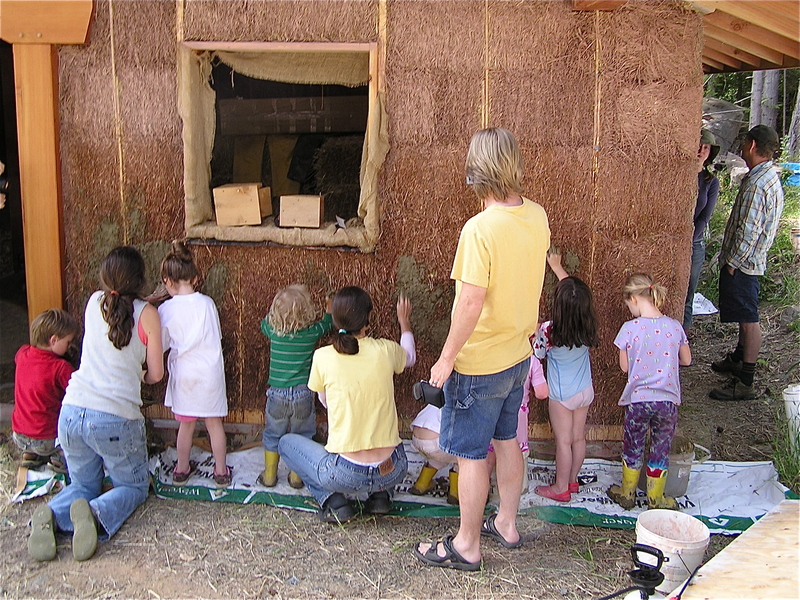 Back in May (2011) we decided to get going on the final lime plaster of the outside of the house before the business of summer cob building took over. Lime prefers to have cooler temperatures in which to dry, and requires much more attention to the timing of the drying process for a result of eveness of colour and trowel lines. 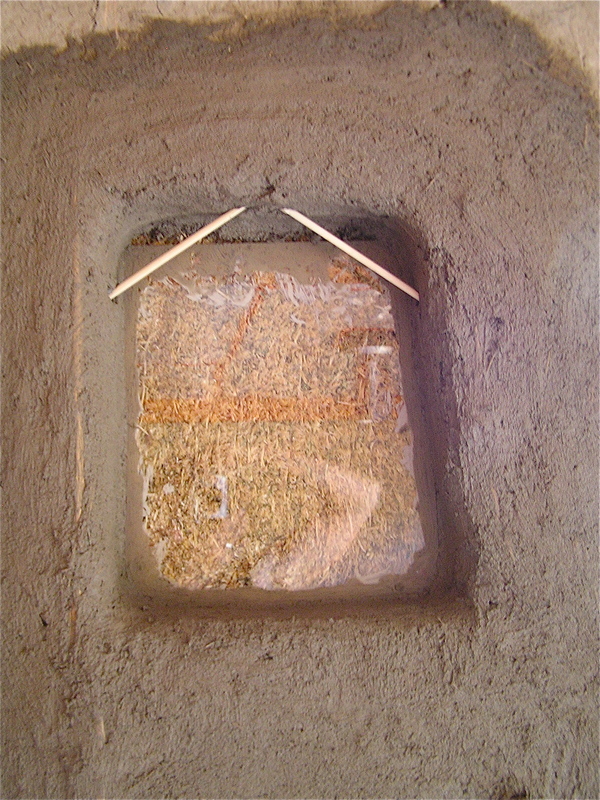 Much like the process of applying the cayolin clay plaster on the inside, lime needs to be troweled on continually until a whole section can be completed, otherwise an apparent line will be visible where the plaster dried too fast, or where troweling stopped. There are techniques to make these lines look less visible if whole big sections are difficult to complete in one go at it. We added a beveled line that undulates around the house, dividing the wall into smaller sections and providing a place for us to stop. That way we were able to plaster only the top section, and then only the bottom, and have the line of plaster meet under the bevel and so be hidden. Working with three people who are competent with the job is important. Fixing spots as you go, running out of plaster when you need it, and being too late for the sponging part of plastering is stressful. So is having the sun come out unexpectedly and not being able to stop to find a way of shading the work space. Likewise, having lunch, snacks, and drinks being made available while working is a huge bonus in making lime plastering a smooth and fun thing to do. The right tools are also necessary. We used Japanese trowels, hawks (easy to make-plywood board with a handle on one side), just like with the interior plaster, and mixed the plaster in 5 gallon buckets and then in a large tub for uniform colour and consistency. 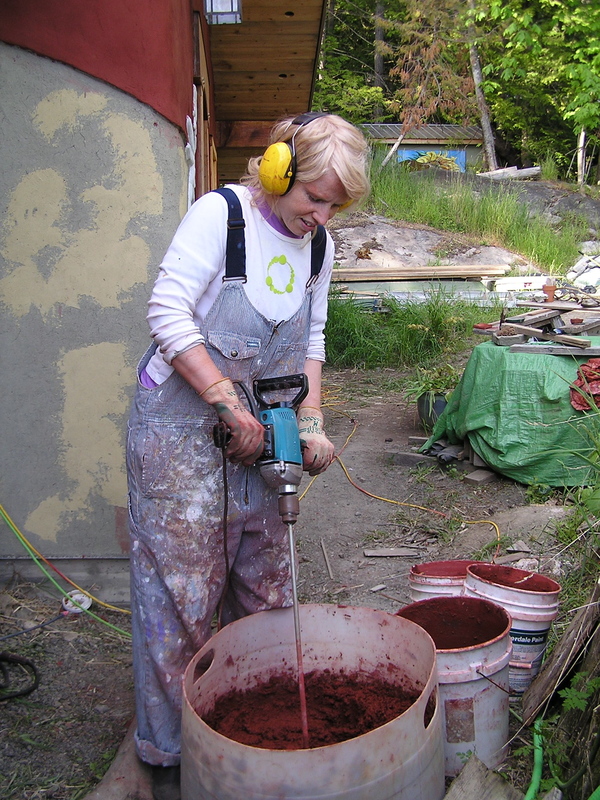 A powerful drill with a paint mixer attached, measuring spoons and cups (depending on colour pigment used), a spatula, and big scooper are helpful to have on hand. Ladders or scaffolding should be close by for high parts. 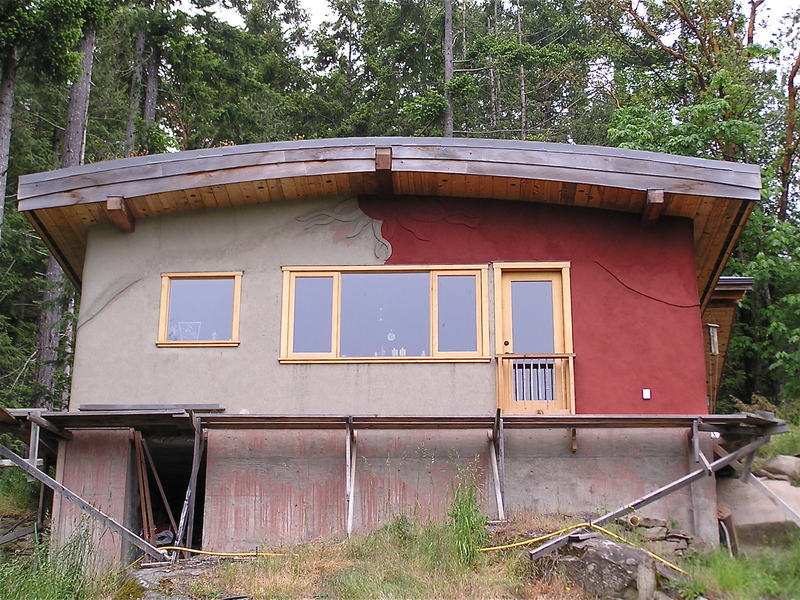 The ingredients are simple- hydrated lime, stucco sand, water, and colour pigment. We soaked the lime in a big barrel a few weeks in advance. We also did many colour samples using a one litre mix, adding pigments in increments of tablespoons to get an array of shades and colour blends. We have many beautiful arbutus trees framing the house, and we wanted to make a colour that brought out a reflection of the deep red/orange/brown that we see in the twisting branches. 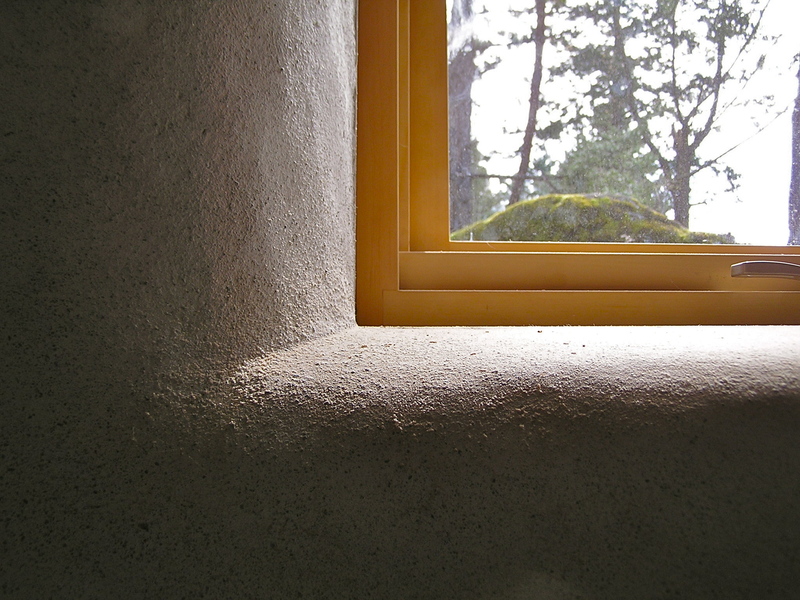 We also thought that such a colour would bring out the vibrant yellow of the yellow cedar window frames. Red pigment, however, has pink tendencies, and so we ended up using ten tablespoons of red in a one litre mix, plus five tablespoons of chestnut brown. 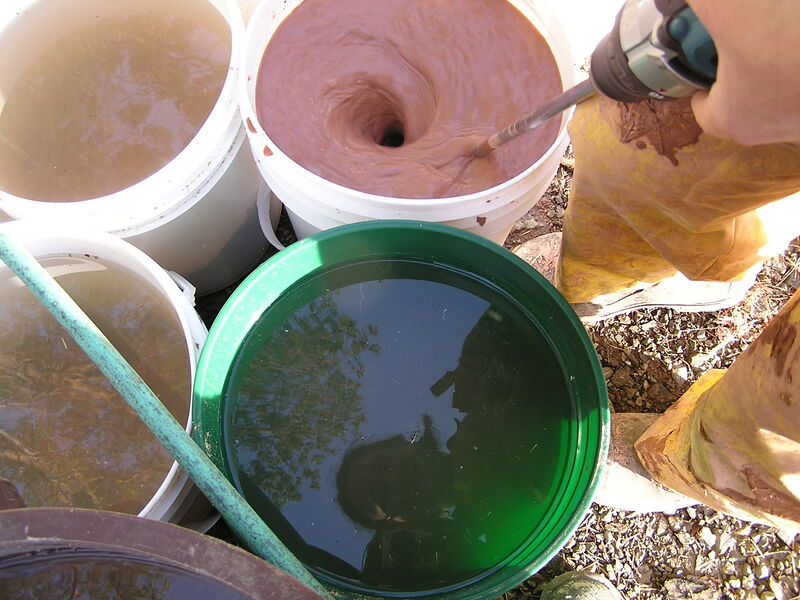 Multiplying that up to 4 gallons in a bucket, and we were deep into a large quantity of pigment. We ordered what we thought would be enough for the whole house, based on calculations for the area covered per bucket on the inside, but discovered partway through the job that we had only enough for just over half the house. We spent way more money on colour pigment than we ever expected, but we were committed to the colour. Lesson #1: estimating for natural plasters is difficult, and calculating for colour pigments is even more complicated. Lesson #2: find a good source of affordable, bulk colour pigments. Because we were pushing to get this job done while the weather was still cool, we just walked in to a concrete supply store and bought mortar pigments that come in small bags. When we discovered just how much we would need, we didn’t want to take the time to find a different source because different pigments have different colour shades. We would have needed to do the colour sampling all over again. By the time we ran out and needed more though, I was very much wishing that we had. However, in the end we spent about $800 in the final outside layer (incl. 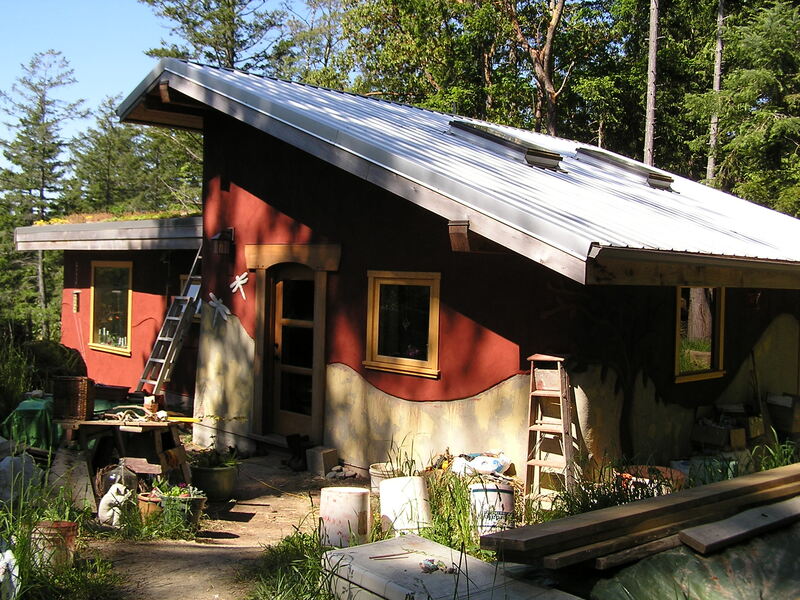 lime and sand), and compared to other forms of siding or paint, we have a beautiful plaster that soaks in to the landscape, accentuates the curves of the bales and the coziness of the forest, for probably less money in the end. The very first thing we had to do, before any of the plaster went on, was to add the sculptural elements to the rough coat. Elemental it was, too – the aspect of the house is situated very close to the four directions, and we wanted to acknowledge the directions and the elements on each side of the house. 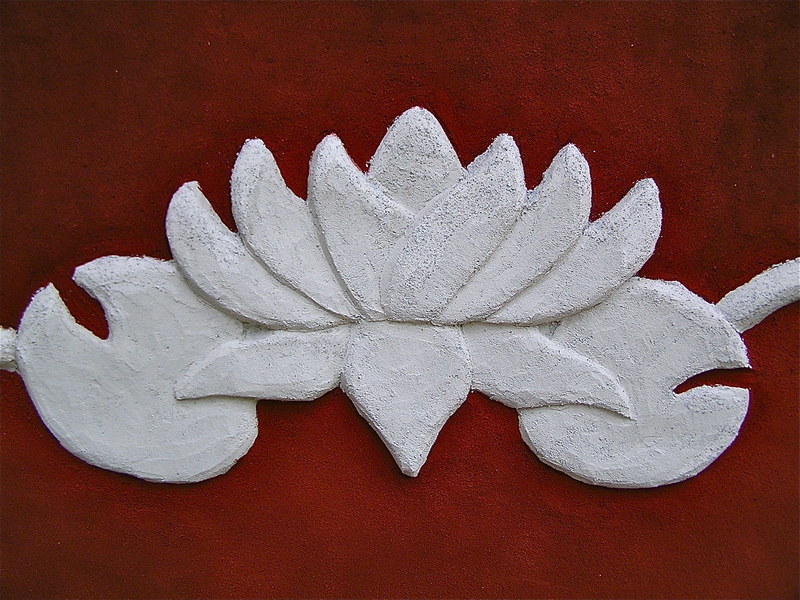 We sculpted a large sun on the south side for fire, and a water lily on the west side for water. 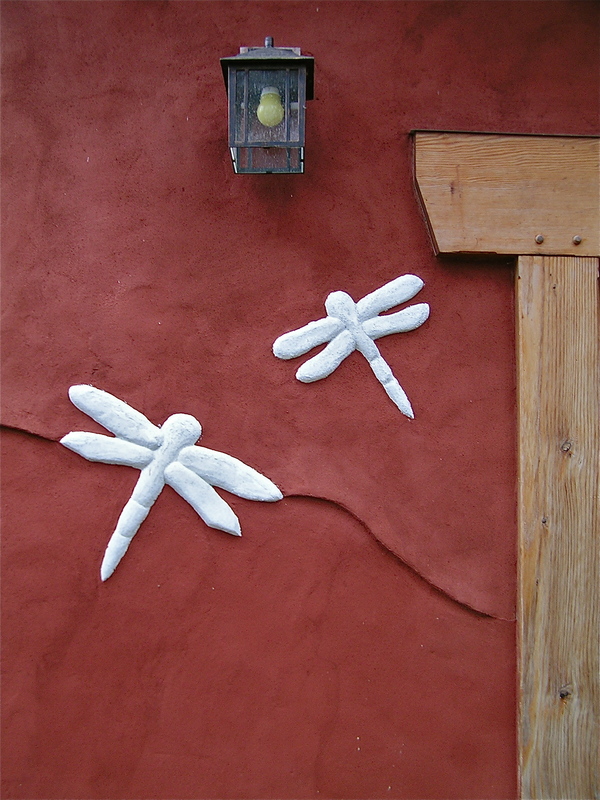 My mom got to work on sculpting a tree on the north side for earth, and I placed two dragonflies on the east wall under the light that shines beside the front door for air. Our beveled relief line that undulates through the middle of the wall flows through each of the elemental sculptures and adds a subtle shadow line. 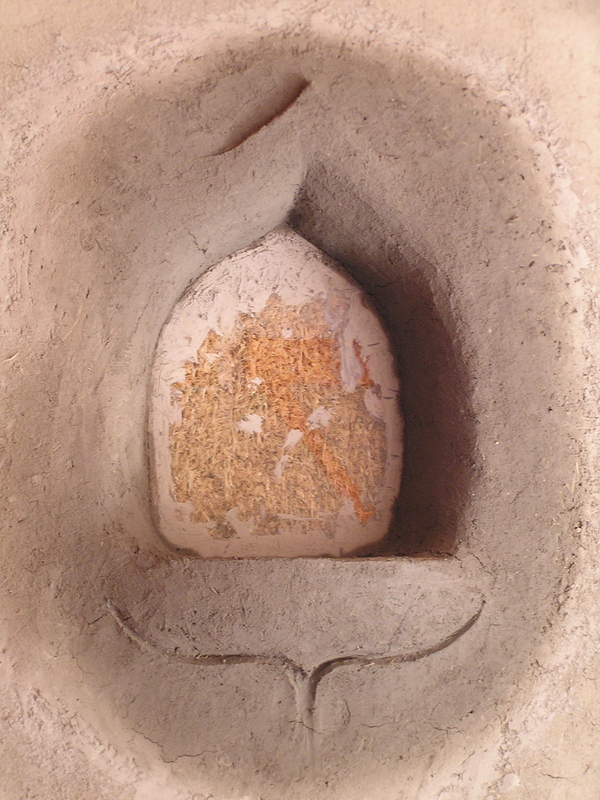 The sculptures were made using the same mix as was used for the brown coat of the walls- 1 part clay, 2 parts sand, and 1 part chopped straw. 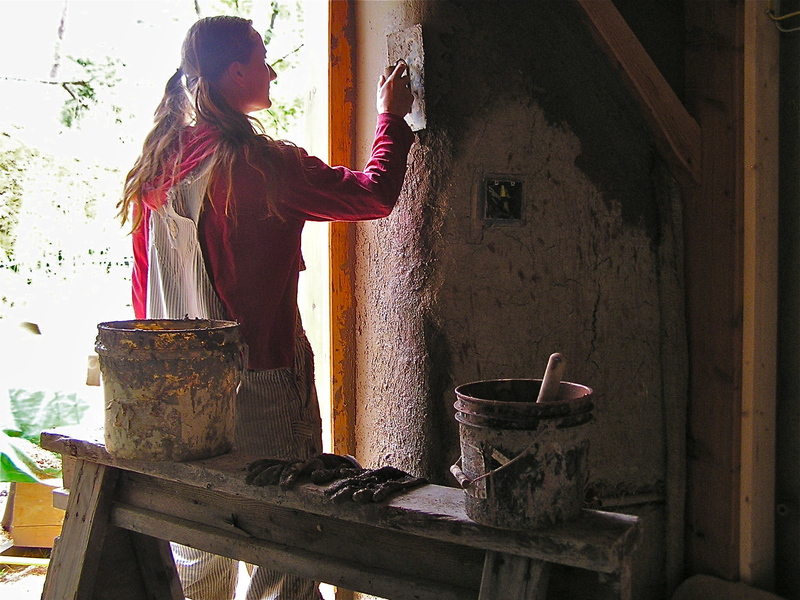 Fine sand and clay sifted free of rocks makes the plaster easier to shape. We also wet down the wall and spread clay slip over the area to help with adhesion. 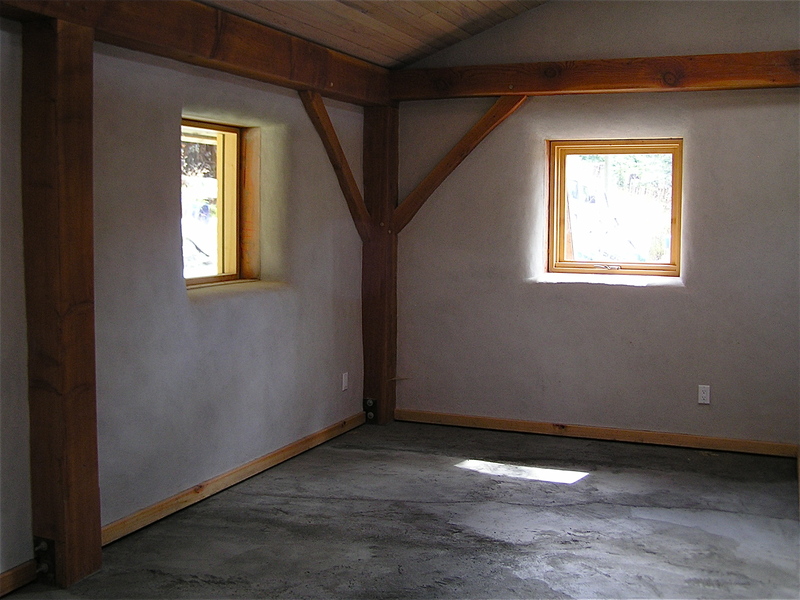 Lime plaster: 1 part lime, 3 parts sand. For us, this meant 5 litres lime and 15 litres sand. That is what we could mix in one 5 gallon bucket. Spin it together with the mixer, and add colour pigment, mixing it in with a small amount of water. Then we turned three buckets into the big tub and mixed them all together. We worked out of this tub until we got low, then had our extra person work on mixing up more. 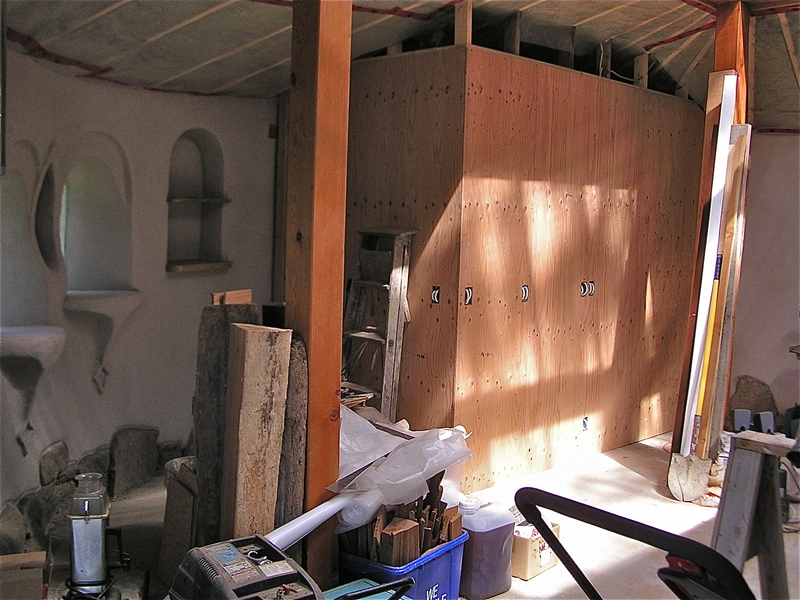 Before we started on the walls, I went around and plastered the sculptural areas first, thinking that it would make plastering the walls faster to do rather than having to do the intricacies at the same time as keeping ahead of the drying plaster. Two were done in white, and two were done as the same colour as the walls. What I discovered was this was not as straight forwards when it came time to do the walls. Red pigment, as well as splatter from the rough coat of clay as it was being sprayed with water, got all over the finished sculpture and needed cleaning and touching up afterwards. Also, it was hard to sponge the plaster without touching the already plastered areas, which made the transitions between the two look smudgy. From a distance, it is not a big deal at all, and since this is the outside, we usually look at it from a certain distance. So I recommend doing it all at the same time- just consider simple sculpture lines and expect to be slowed down considerably when plastering these areas. Small tools are essential, as well as the all useful yogurt lid with the rim cut off. The sponging part of the process comes when the plaster is tacky enough to leave finger prints but dry enough that no plaster comes off onto the fingers. It can be a very precise moment, depending on the weather and how fast the plaster may be drying. A damp sponge is simply moved around in circles to remove the troweling marks and give a smooth, uniform look to the whole wall. Sponging too soon will pull at the plaster too much, and sponging too late means that the sponge needs to be wetter and a stronger motion is needed to smooth out the trowel marks. A well troweled wall, however, won’t have very many marks to be eliminated. We noticed that sponging on a too dry wall caused a variation in the colour pigment, making it a lighter shade, just like when we sponged near an already plastered spot and brushed up against it. Our process went pretty smoothly. Colin and I mixed what we needed for the day and did the troweling with a friend who pre-sprayed the wall sections ahead of us with water, sponged along behind us when the plaster was ready, and helped remix some of the plaster from the bottoms of the buckets when it began to dry out too much. Getting familiar with the perfect consistency is learned simply through using the plaster, and noticing when it is too dry and difficult to spread or too wet and sliding off the trowel. The motion of getting it from hawk to trowel to wall is also a practiced motion that comes with repetition. Generally, I would make lots of little overlapping rainbow swipes over a one foot square area, and then smooth the whole area down in larger swipes right away, and move on. No putzing allowed! Get it on, flatten it out, and move on. 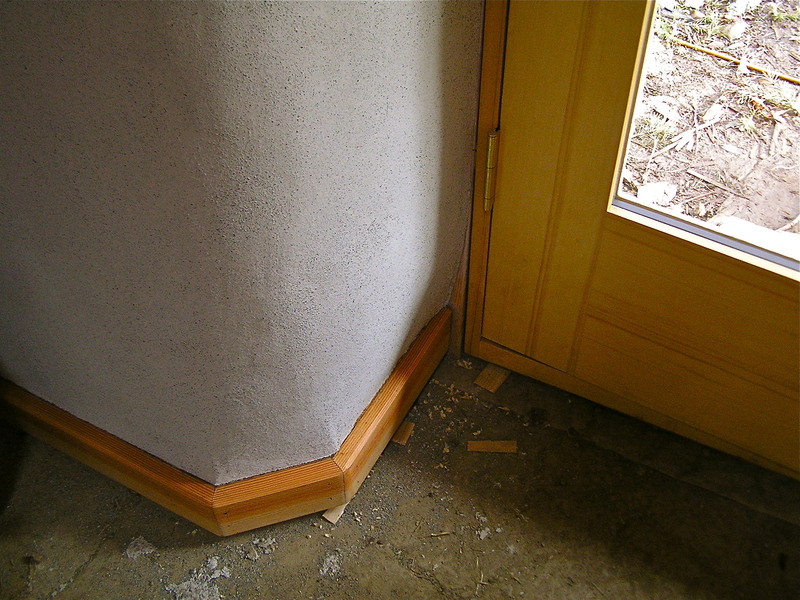 Plastering a whole house gives lots of opportunity for repetitive motion learning… start with the most hidden space and do the area around the front door last. 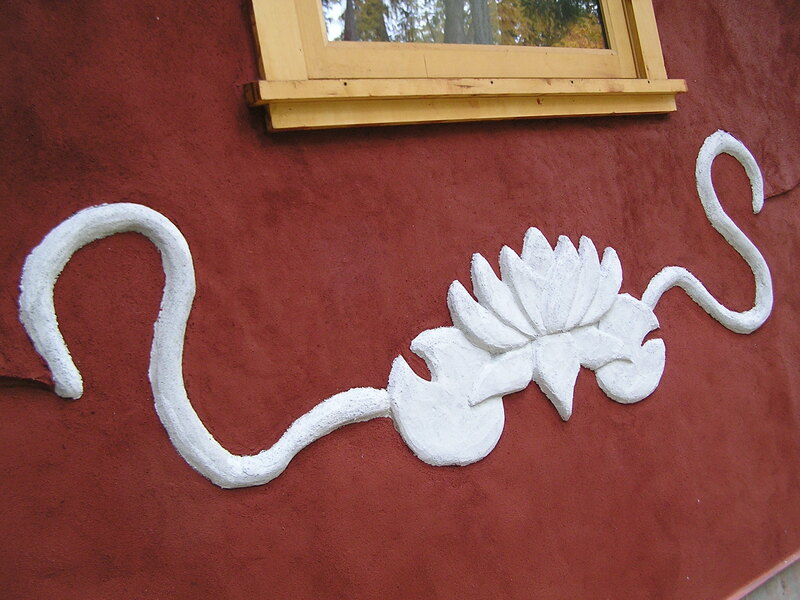 There are many details and considerations with lime plaster, and it is helpful if you have experience with some other form of earthen plastering, or if someone who does can give a hands-on lesson. Again, we had the direction of Tracy Calvert, who has been building naturally since the 1980’s and has specialized in earthen plasters. 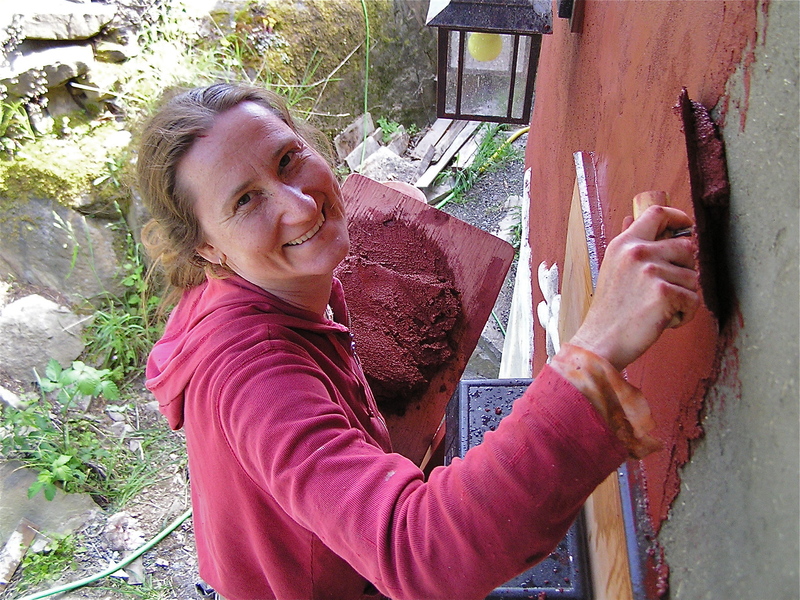 She has led many workshops and believes that skills of natural building are to be available for anyone willing to learn, like the traditional practices passed down from cultures around the world that enable the reality of shelter for everyone in a community and not only for the wealthy. 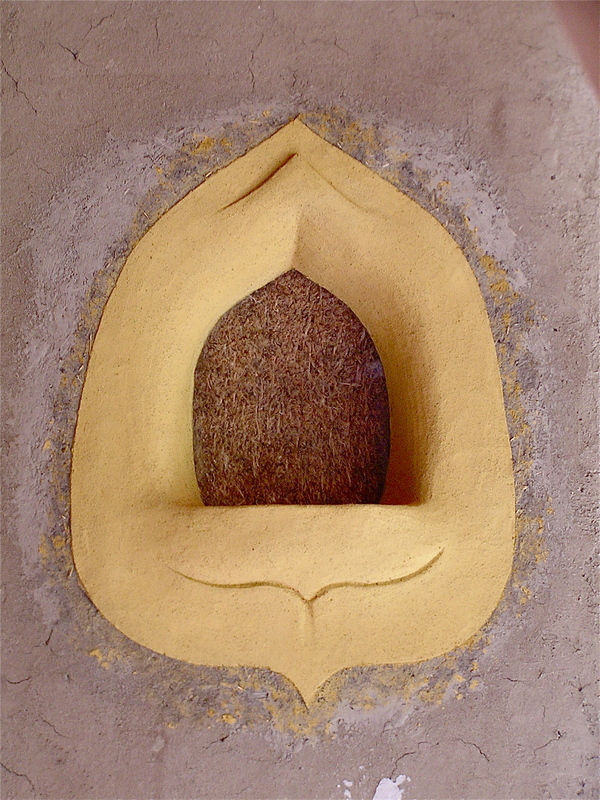 While we have used the basic mixture for cob in many places of the house- in the floor, as rough plaster coats, and for sculpting – we have only one small wall that pays tribute to the building techniques of cob. 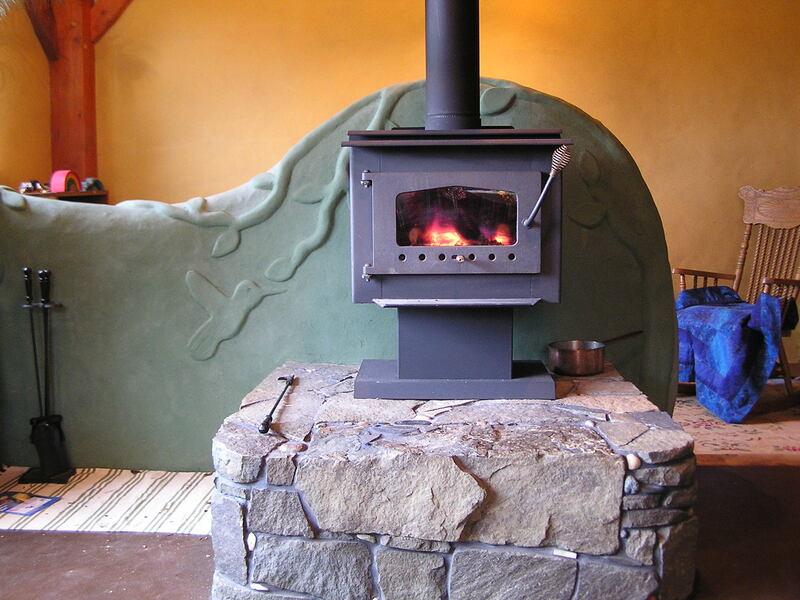 It is a short barrier that separates the back of the wood stove from an area that will one day be a staircase leading down to the rest of the house. 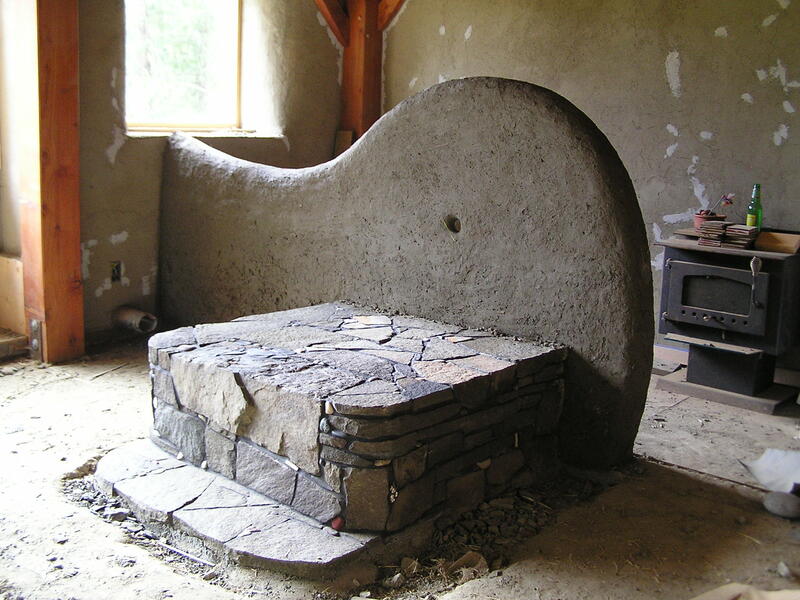 Only 8 inches wide, it does not have the usual girth of a supportive wall, and rests on a ledge of concrete that was poured with the rest of the foundation and connects to the back of the two foot tall stone hearth. We embedded an air vent pipe that opens from the outside wall to behind the stove, allowing the stove to draw in fresh air as it burns. We started the wall with a work party, inviting families, neighbors, and interested friends to lend a hand or foot in stomping, wheel barrowing, and shaping. Children and cob ar e a perfect mix and add such a joyful presence to the job! 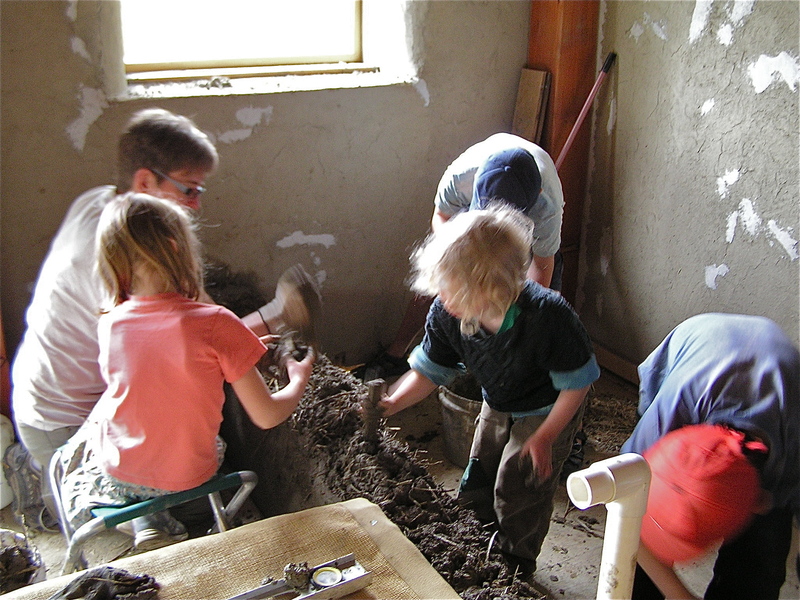 We used clay from our huge pile gathered for the previous plastering and floor sections, clay that originally came from a farm down the road that dug themselves a huge pond and discovered clear blue clay. The sand is pit run sand from the island, (a silty and rough sand with lots of rocks – just fine for cobbing with) and straw leftover from the bales we got for the house. 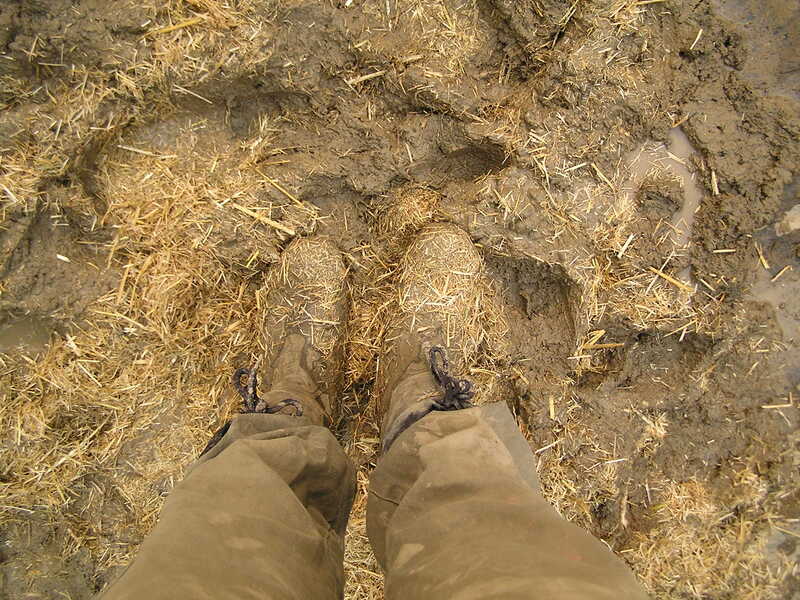 Stomping includes mushing the mix together with your feet on a tarp, adding water as needed and rolling the mix in the tarp once in awhile to help move the bottom stuff to the top. Inside the house, we took handfuls and pushed it into the growing ledge of the wall, using thumbs and sticks to really integrate each handful. The work party got us up about 2 feet, at which point the weight of the cob began to cause the wall to slump out the bottom. 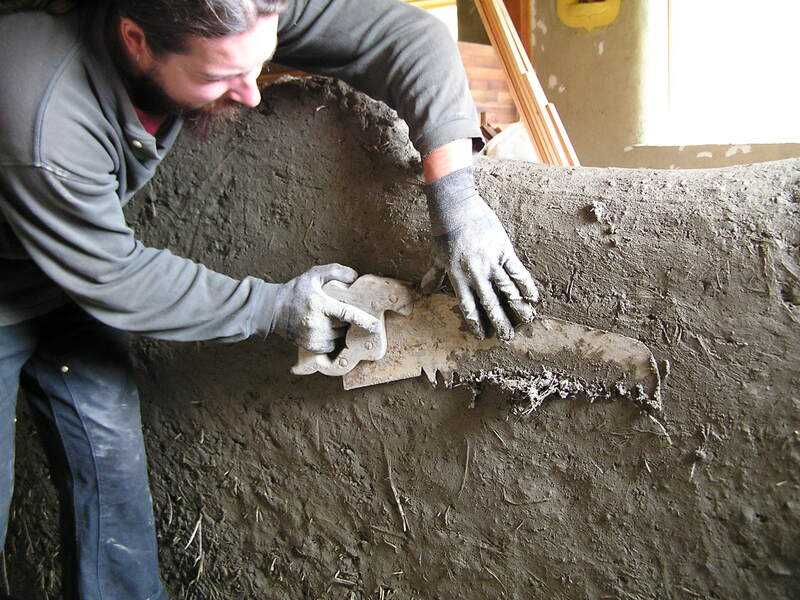 We let this part of the progress dry out for a day, then used a saw with large teeth cut into it to trim off the excess cob from the bottom until it measured the right width again. We could then continue to add on to it until it began slumping again. The lowest part of this wall reaches just over three feet, and then arches gracefully up another foot behind the hearth and the wood stove. Then my mom got her hands in there to sculpt a draping vine along the top and dangling down the sides, smoothing out the top of the wall in a rounded curve. After letting the wall completely dry out (about a month!) I could finally mix up some green colour samples for the final plastering. 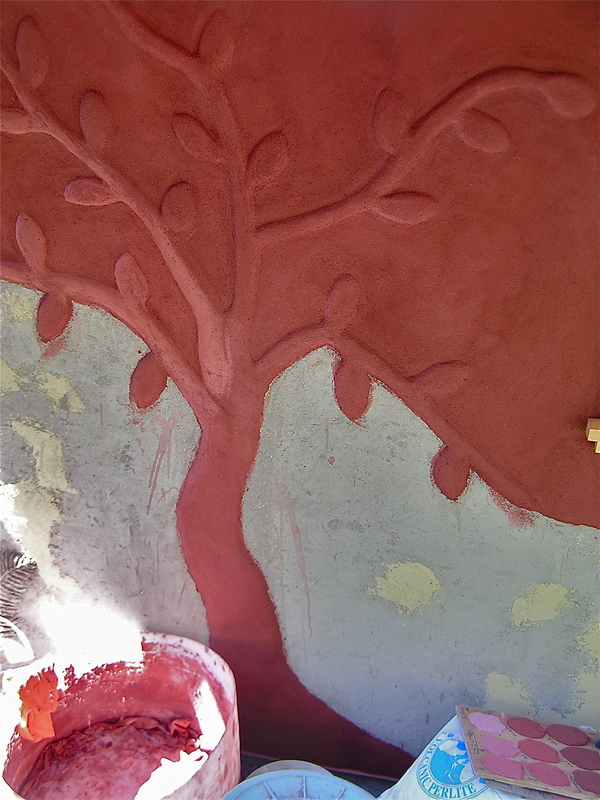 (See my previous post, Final Plastering, for details on mixing and applying natural clay plaster). 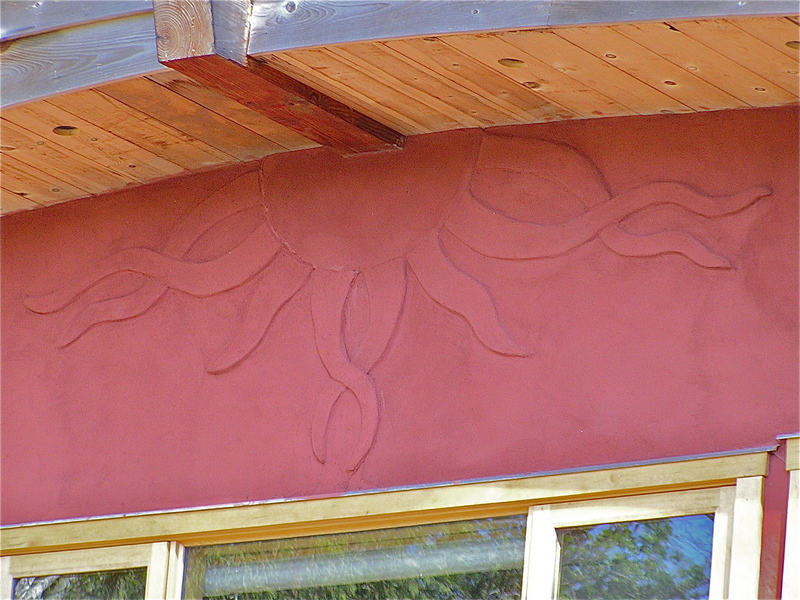 Working around the sculptured vine took lots of patience and forgiveness, but in the end the natural quality of the plaster reflects and brings out a beautiful ease and grace framing the hearth. 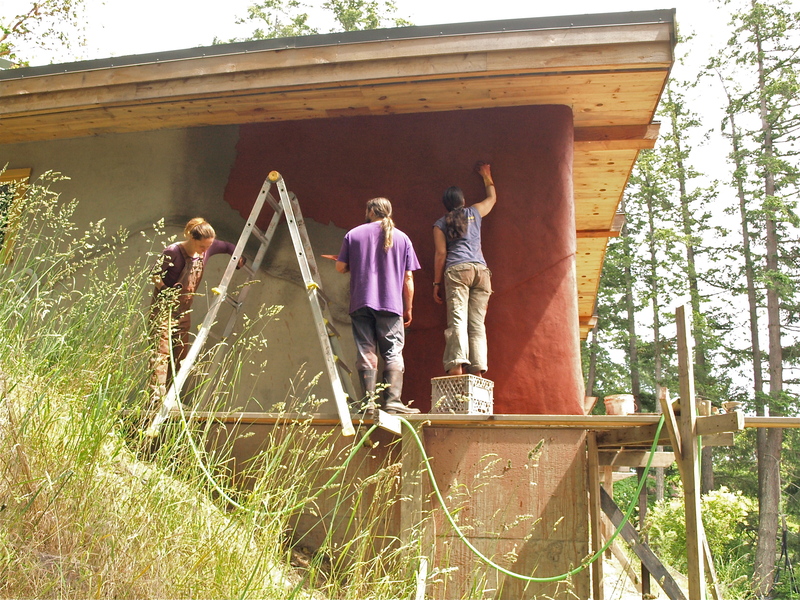 This summer, we have finally completed the last layers of the inside wrap of the house, including all the flooring and the final coat of clay based plaster on all the walls. This last layer of clay plaster was much more particular in recipe and in application than the rest of the rough layers, and calls for it’s own chapter in explanation. (I have already outlined the procedure for the rough coats of plaster in a previous posting, Natural Plaster.) I would like to express my understanding of our process in openness to the many other recipes, methods, and materials that have been used with success throughout time and in many different places. 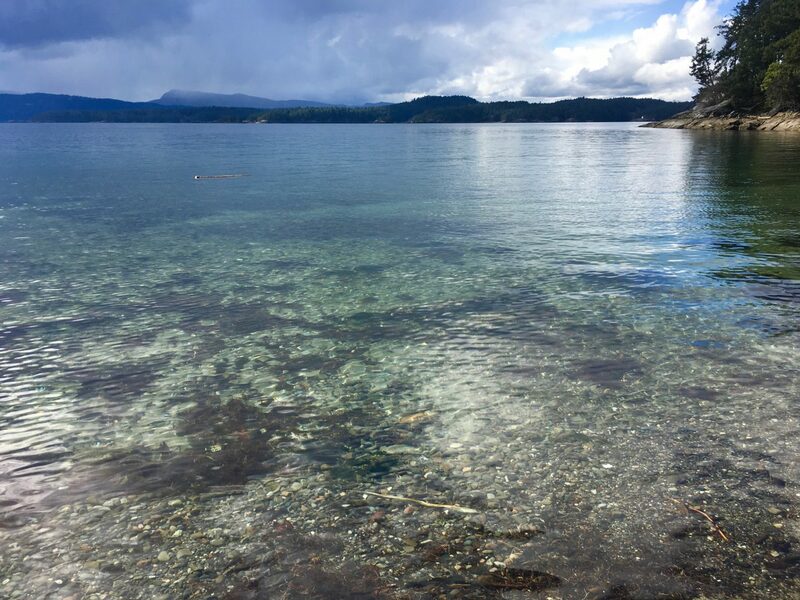 My experience is limited to our one house here on the west coast of Canada. However, we have also been guided by our friend Tracy Calvert who has compiled her own knowledge and experience and has willingly and generously passed it on to us throughout our journey. The ingredients in the recipe that we used are kaolin clay, stucco sand, fine straw, whiting (calcium carbonate), paper pulp, rice flour, and a small amount of borax and white glue. 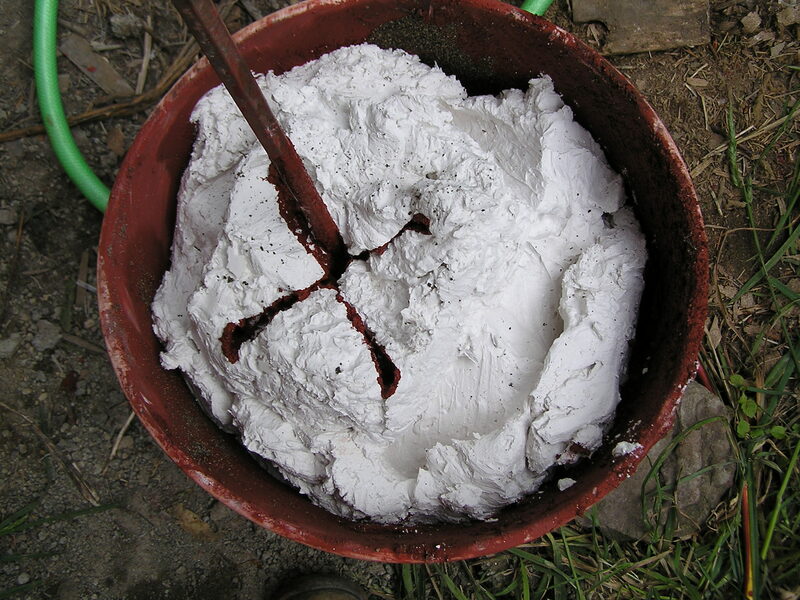 The Kaolin clay is a fine powdered porcelin clay that was purchased at a pottery supply store, as well as the whiting, which is basically a chalk filler. We used finely chopped straw left over from baling, but we also used an alternate fiber material of bulrush down, the fluffy insides of cattail heads harvested before they turn inside out. The sand is just fine washed stucco sand, and the rice flour is mixed with hot water and made into a glutinous paste. We soaked newspaper overnight and then pulped it up with our paddle mixer, which we used to make the plaster in buckets. Ratios are as follows : 6 parts sand, 4 parts clay powder, 2 parts whiting, 1 part straw, and 2 parts paper pulp, 3/4 part rice flour mix, a handful of borax, and two or three glugs of glue. One part for us was a 1 1/4 litre bucket. First we dry mixed in 5 gallon buckets the sand, clay, whiting and straw, then added the paper pulp and enough water to make the mix spin easily but stiffly. Because we were going to wait to plaster the next day, we left the mixes at this stage overnight. When we were ready to plaster, we added the rest of the ingredients and any colour pigment we were using, then compiled three of the buckets into a big tub and mixed them thoroughly together. This helps with consistency of ingredient quantities as well as getting the bottoms of the buckets mixed in well. For colour pigments, we did some test samples using tablespoons of pigment to 1 litre of mix, then allowed the samples to dry to the finish shade. We then multiplied the tablespoon quantity for the amount of litres in the 5 gallon buckets (some estimating was definitely relied upon) and added that amount of tablespoons of pigment per bucket. Finally we were ready to put it on the walls! We sprayed the walls with water to help bond the two layers together, then considered how to plaster each section without stopping or ending up with long edges of plaster that are left a little too long and begin to dry out. Unlike the regular clay plaster, there is only so much re-wetting that the plaster can take before it is too difficult to smoothly work new plaster up to it without leaving lines or smudgy areas. This sensitivity to time makes considerations of temperature and air flow quite important, and usually requires two or three people working together for smooth going. We had two of us plastering, and one person in charge of mixing up new mixes, moving ladders, bringing coffee, keeping the music flowing, and generally making it possible for us to keep working our lines until a section is done. 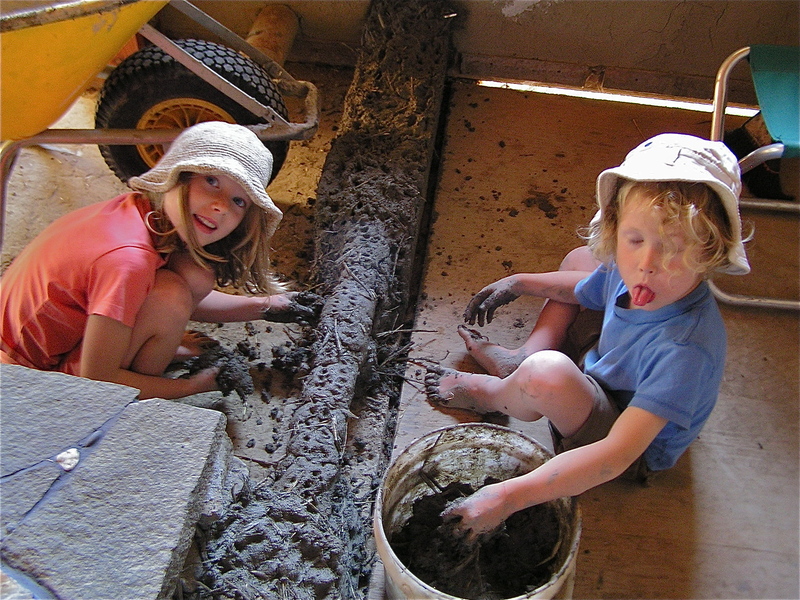 We spent almost five days in total plastering the whole inside of our house, which worked out to be about 1200 square feet of wall and used approx. 27 buckets of mix (one mix being one recipe.) We used japanese trowels, bought through the internet, and homemade hawks (rectangles of plywood with a handle on one side), as well as a few smaller tools for tight corners and edges, and yogurt lids with the rim cut off for shaping curves. Generally, we covered an area with overlapping rainbow swipes, then flattened them all down in larger sweeping motions. We plastered over drywall as well, which we had prepared with glue and sand to provide a grippy surface. All the kickboards and window and door trim were put in place first so that the final plaster came to meet the trim and seal any spaces. 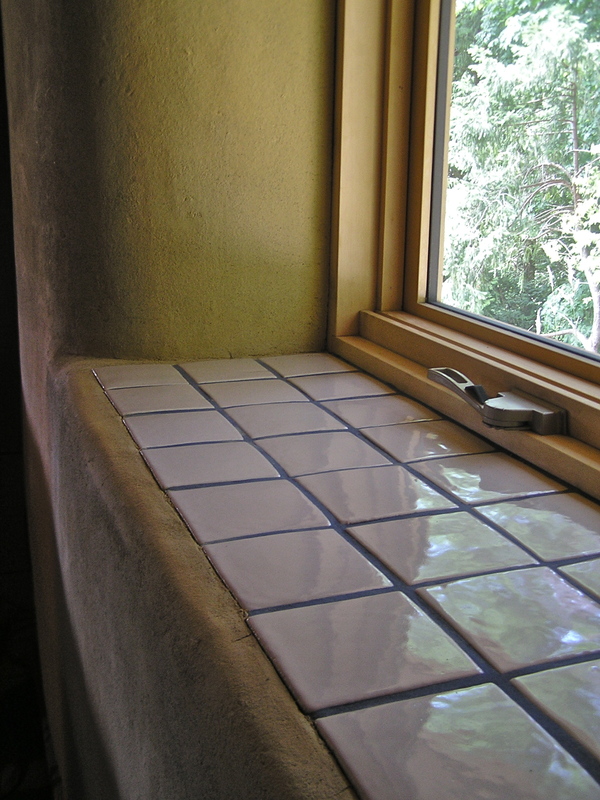 We also tiled the sills of some of the windows before hand. 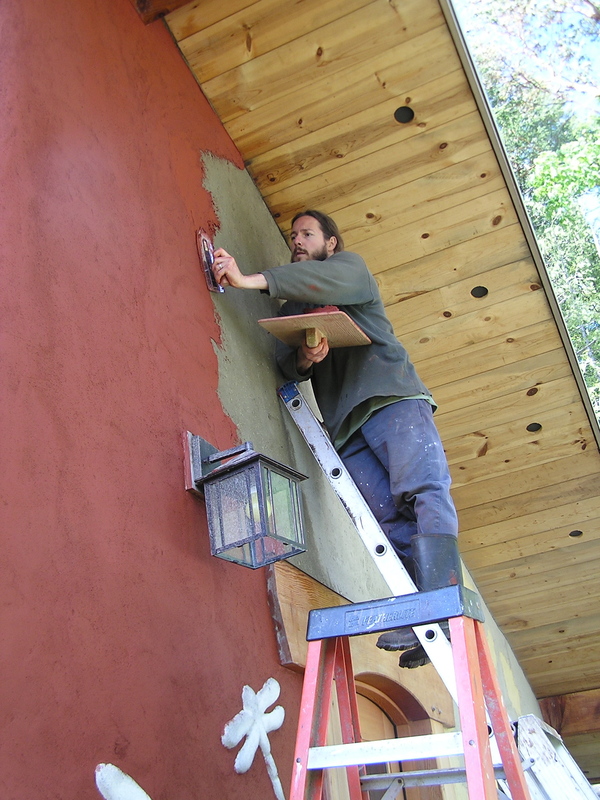 At a certain time of dryness, we went over the whole wall with a damp sponge to blur any lines and troweling marks, then at another certain point in dryness we burnished the whole wall with a yogurt lid. This brings up the clay and pushes in any sand, and gives the plaster a certain polish that makes it more durable and smooth. 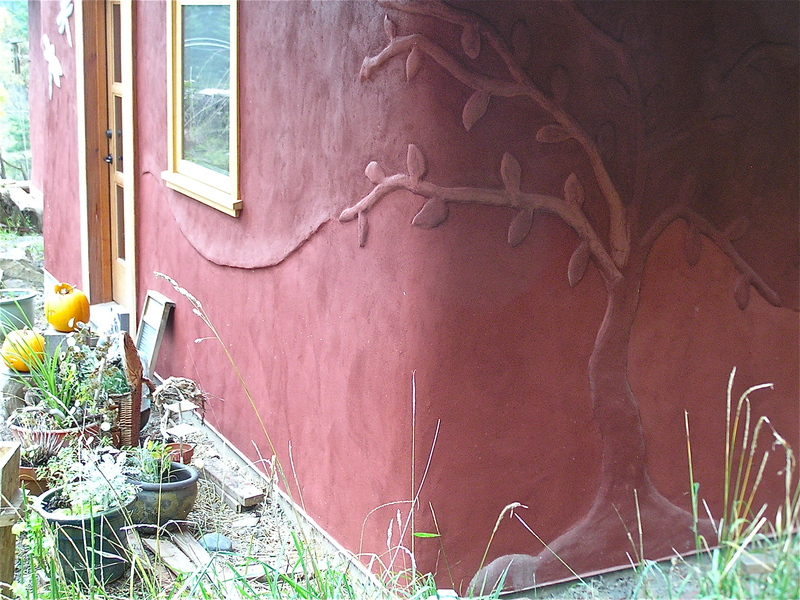 We are so happy about our earthen walls, from the clay slip through the rough coats and finally plastered with the finished layer. 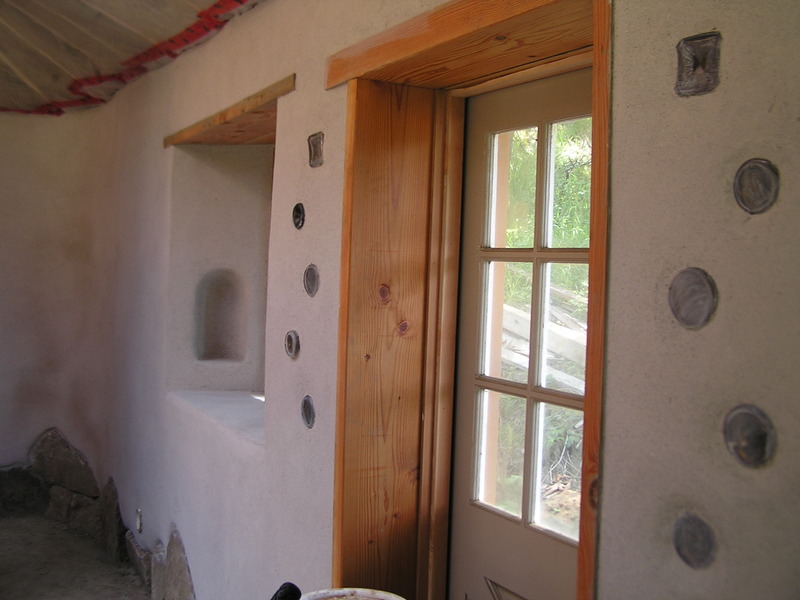 I began this house knowing absolutely nothing about natural plaster, and although it took lots of work and patience, it provided a full scope of learning the art of earthen plaster. There is always more to learn, and I look forwards to continuing on and developing my methods and skills throughout the second half of the house. I am so very grateful to Tracy for leading us on this path and providing support as well as space for us to take it on and call it our own. The passing on of this type of skill is important to her as we share and expand our self- sustaining abilities for building beautiful and healthy homes. 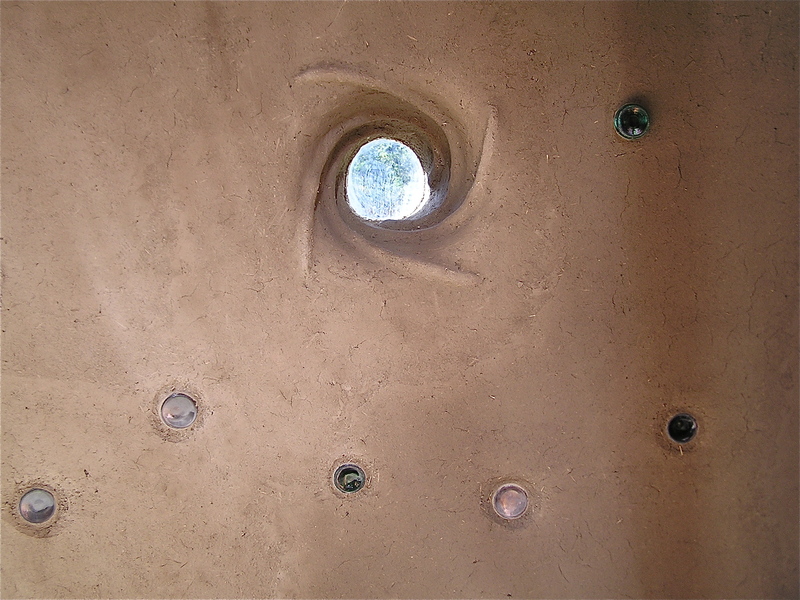 A traditional feature of strawbale houses is the truth window – an opening through which one can see the straw inside the walls. 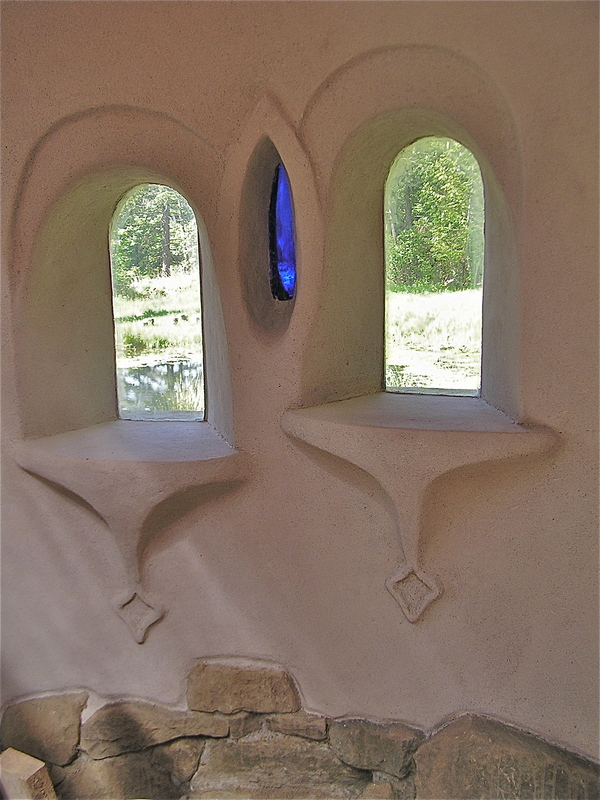 Like every strawbale house, truth windows are unique and creative, providing a little peek into the golden stems. Truth windows often take on the role of an altar, bringing gratitude for the sources of our materials and reminding us of the reasons for the choices we have made. We have seen truth windows as elaborate wood frames, recycled metal grates, little doors that open to reveal the straw, and anything in between. 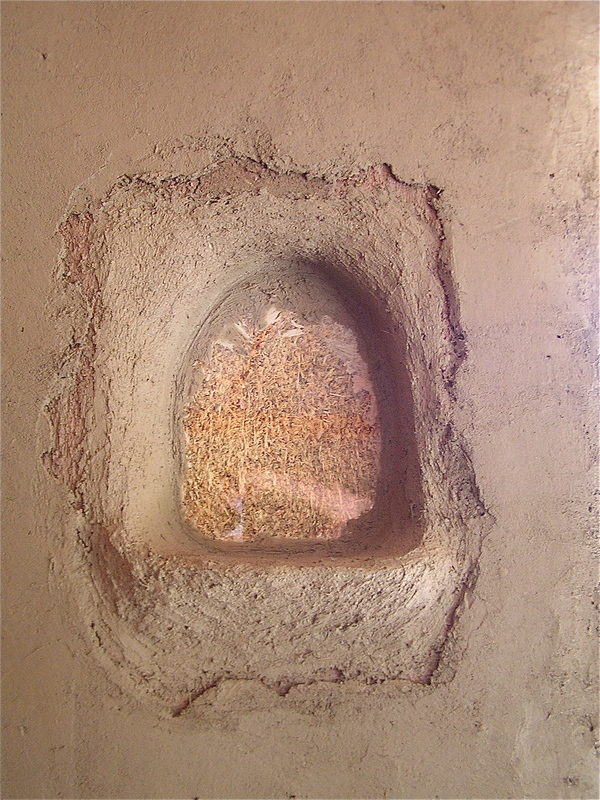 We went through a few different designs before we finally settled on the simple use of the clay plaster as a sculpting medium in which to frame and hold in place the piece of glass against the bales. I decided to build out the bottom of the frame to create a small ledge in which to place little treasures, much like the objects that adorn an altar. First we trimmed out a recessed area of the bales by about 4 inches and set the glass in place. I used a pair of chopsticks to help hold up the plaster that would shape the top curves of the frame, then applied a first coat of plaster. 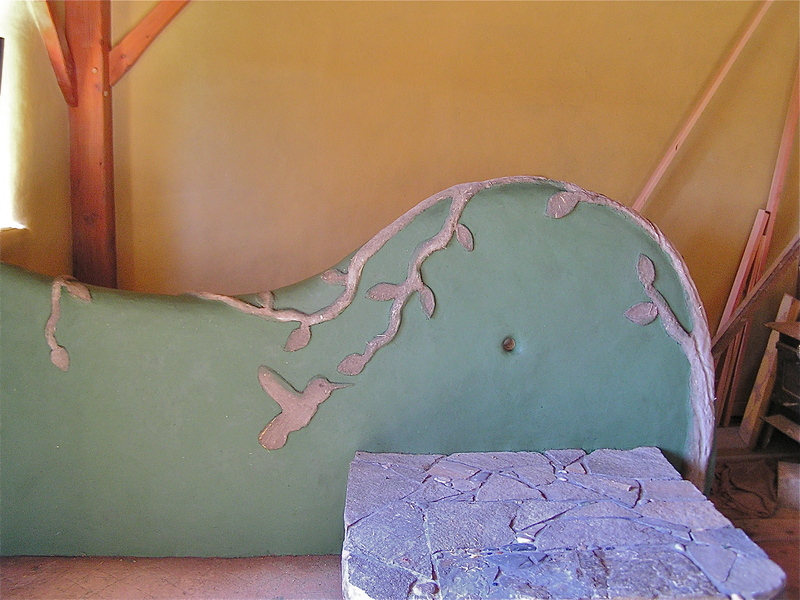 With the second coat of plaster, I built up the shape that I wanted in the curves, and added the little reveals above and below the frame. The beautiful thing about such a sculptural style of building is that you can really make it up as you go, erasing and starting over, correcting and being surprised by what happens. I haven’t done much sculptural work in my past, so getting the picture of what was in my head on to the wall was an interesting challenge of dexterity and a good lesson in flexibility. What the truth window ultimately ended up being was a combination of a vague idea and surprise. For the finish plaster, I used the coloured plaster that Tracy and I had made up for our colour samples for the front room. We ended up with a beautiful orange that was too dark for the whole room, but would make the truth window stand out against a lighter shade of the same colour. We haven’t done the rest of the room yet, but we are working on getting all the other prep details done so we can do the final plaster sometime in July. So for right now, our finished truth window sits lovely and peaceful amongst the strew of construction and chaos. 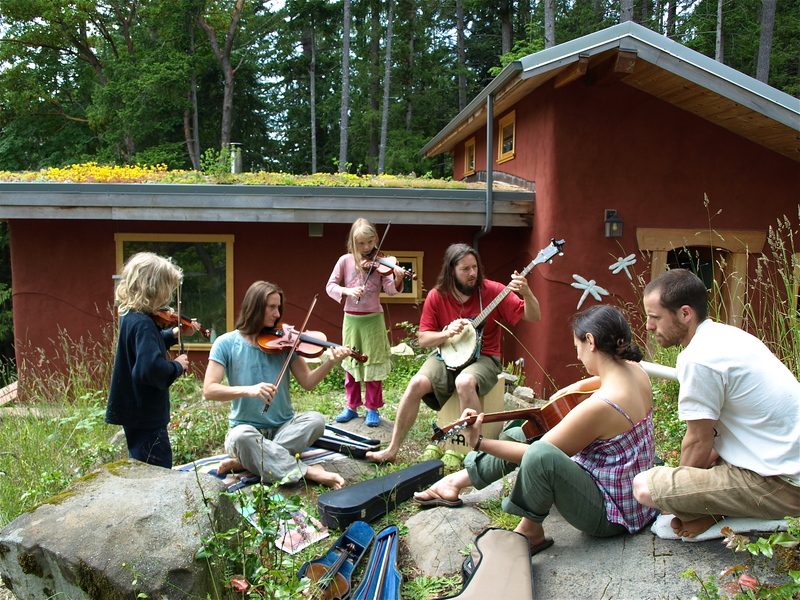 We look forwards to sitting just below it, eating our meals and rotating our treasures in gratitude for the soil, the sun, the rain, the seeds and the hands that cared for what has become the walls of our home. 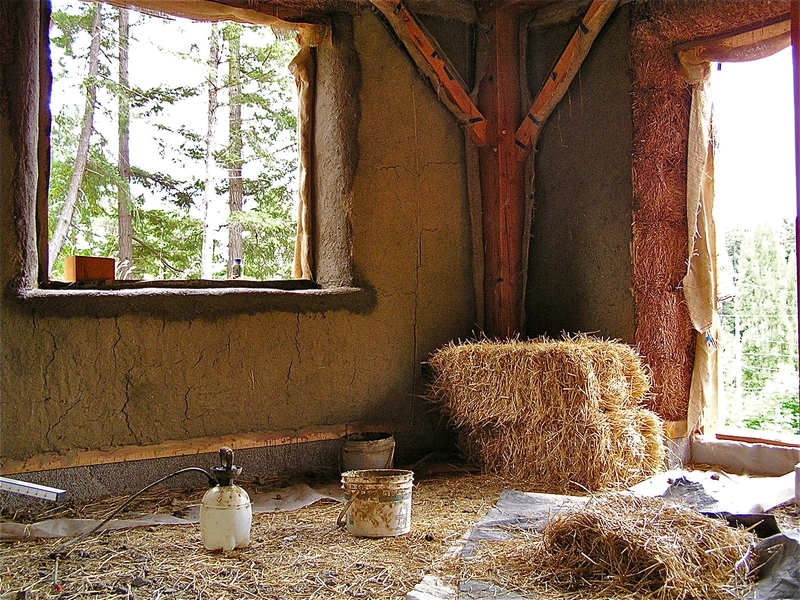 A large part of the strawbale construction of our house is the natural plaster system that closes in the bales while still allowing a flow of air to pass through, supporting a breathable wall system that is totally weather proof. I am not going to pretend that I can write a whole how-to guide here on this post, but instead I hope to give a most complete account of what we did to our walls, and hope that it is helpful to anyone interested in taking on natural plastering, or it is interesting to anyone just curious. There are many books, websites, people of knowledge, and workshops out there that can give accurate (and sometimes conflicting) information, and we have taken these steps available to us for what makes sense for our situation. We have been blessed to have with us in our community an experienced natural builder and good friend, Tracy Calvert. She has been integral in directing our experience, and helping out with the attaining of supplies and tools. 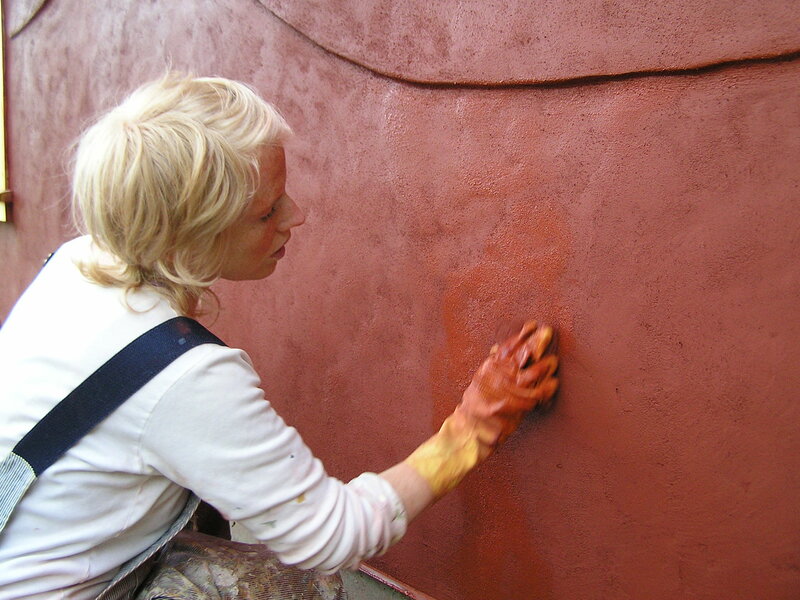 She is especially experienced in the art of natural plaster and it’s many layers of applications. Our first layer was covering the straw bales with clay slip, which is essentially like splattering the straw with thick chocolate milk. Messy. 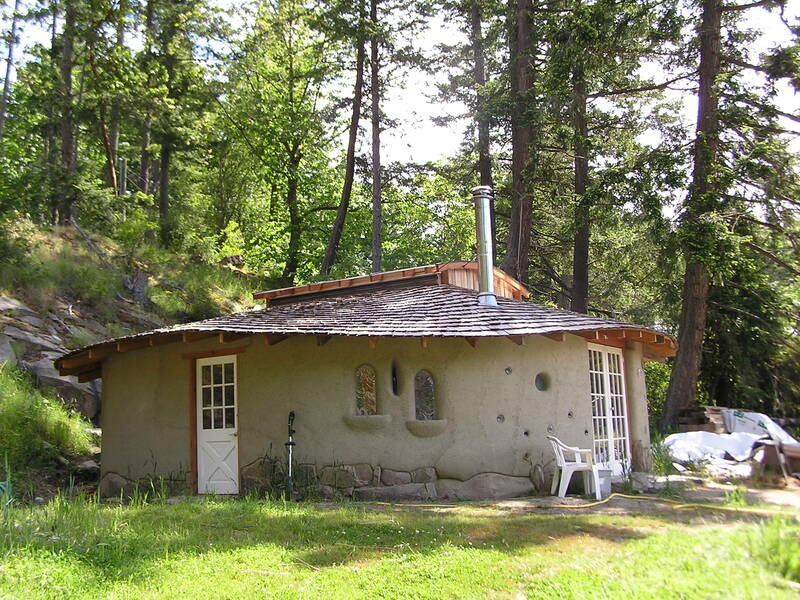 We obtained the clay from a pottery studio on Mayne Island, it is the off cut pieces from the creations of the studio which were destined to be sent to the landfill. Some studios take the effort to reconstitute these wastes back into usable clay, but it is an arduous task to reproduce good quality clay. Many studios prefer to consider these bits unusable, and so having them picked up by natural plasterers is a positive move for everyone. After soaking the clay, we mixed it up with a heavy duty paint mixer mounted on a drill, until it was thick and smooth. My method for getting it on the walls was to splash it on with one hand, holding a bucket below to capture what didn’t stick while rubbing it into the fibre of the straw. Whatever technique is used to get the slip on the wall is a good one, there really isn’t any wrong way. I covered every visible straw bit of the house, inside and out, turning it a lovely shade of dark reddish-pink. It then spent a whole winter like this. 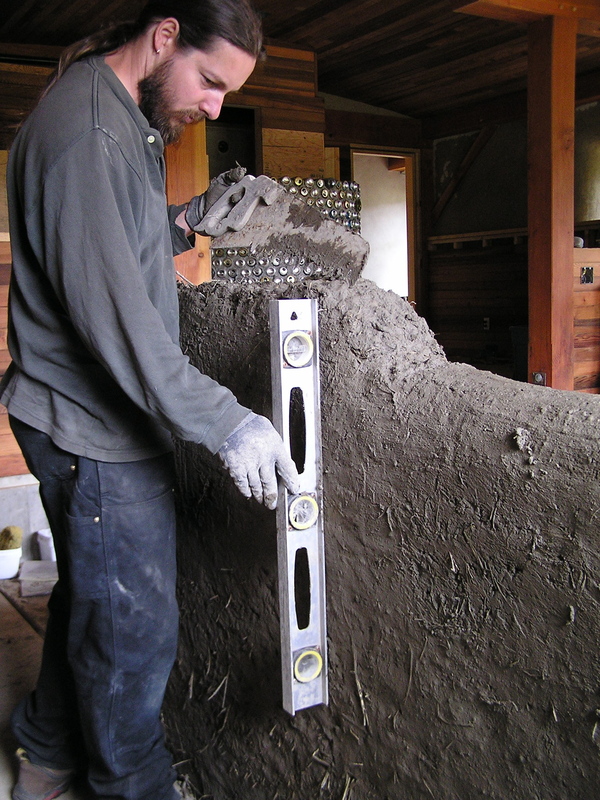 Layer number two is a cob mixture of clay, sand and straw mixed up in batches by foot and pushed on the walls by hand. We got local clay from a farm down the road who was excavating a pond, pit-run sand from a local quarry, and the shavings of straw from when we trimmed the bales to make the surface even. A good test for determining the quality of the clay is to do a jar test- put some clay in a jar with water and shake it up, then let it settle. 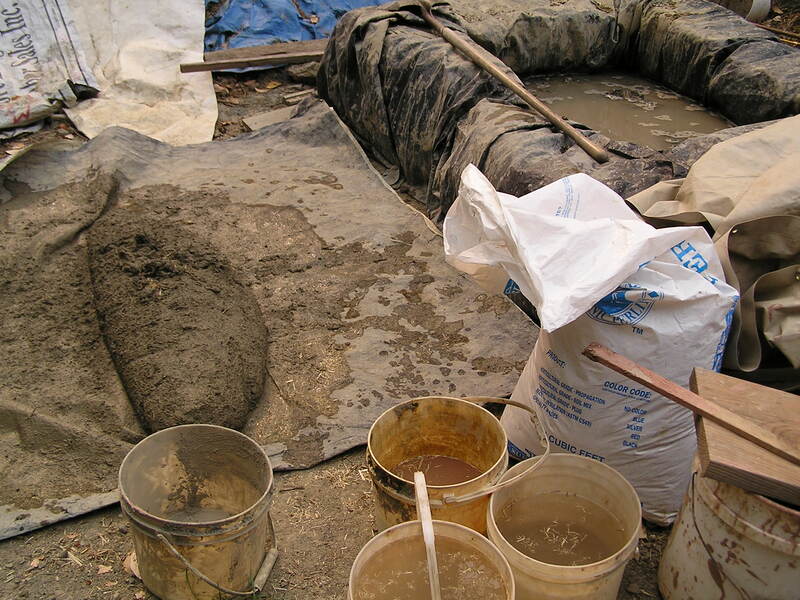 This will show the ratio of silt to clay, and whether or not there may be too much silt in the clay. Ideally, the less silt, the better. We built a soaker pit from leftover bales draped with a solid tarp, and kept it filled with softened clay ready for using. 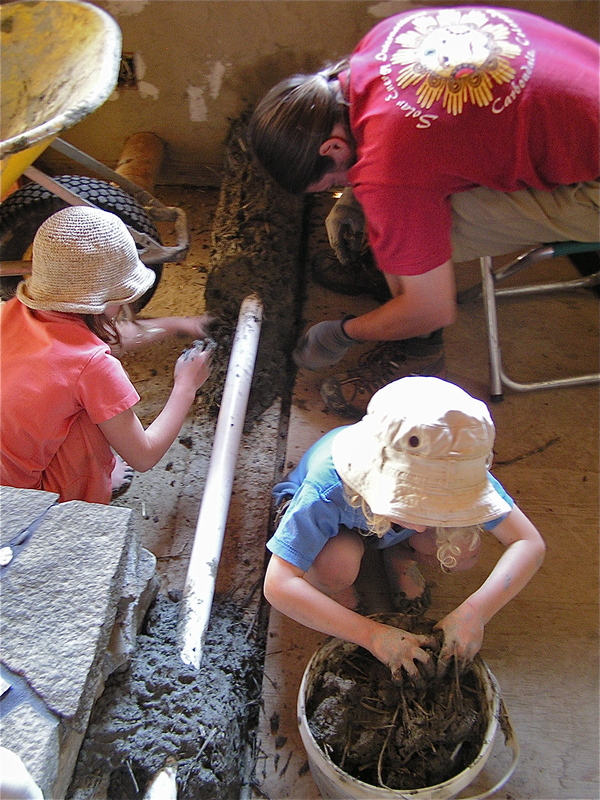 After spraying the walls to get the slip wet, we pushed on the layer of plaster, spreading it about a half inch thick. We started in early spring with a birthday party for our 4 year old, inviting all his friends and their families- really, this layer isn’t very difficult to master and it’s lots of fun to do with friends. I had home school plaster parties, ladies’ night plaster parties, and afternoons with a few friends and their kids playing nearby. The inside and out was finally done by the fall. I was able to get started on the third layer in April. Tracy came for a morning and went over the variation of the cob mix- this time the ratio of clay to sand was 1:2, with one and a half buckets of finely sifted straw. (I used a certain bucket for measuring, and went through a few mixes of experimenting with ratios before finally getting to the mix that cracked the least.) The sand we used was a finer, washed sand. 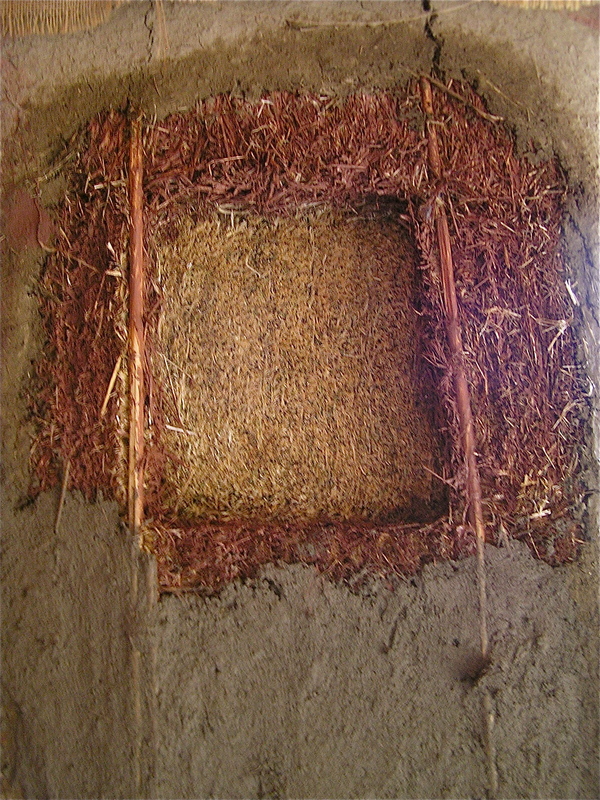 This layer is applied with a trowel, and encompasses the task of sealing in the flaps of burlap that connect the bale walls to the timber frame. (Since clay doesn’t stick to wood very well and shrinks when it dries, a strip of burlap was stapled to the backs of the places where straw meets wood, and so the clay doesn’t move away from the wood when it dries.) The burlap has to be rightly stuck down, so we brushed it with more clay slip until it was nicely saturated, then we rubbed it in roughly with plaster before applying a smoothly troweled layer of plaster. 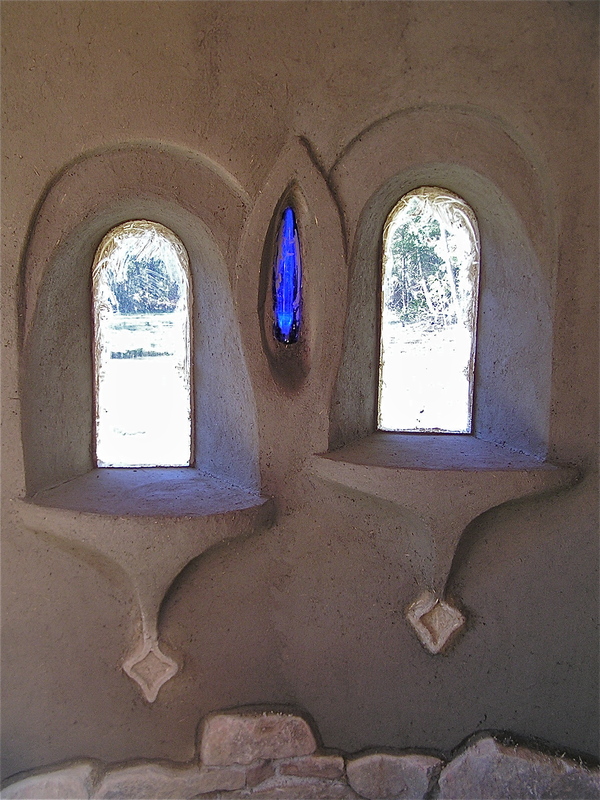 We also took the time in this layer to shape those beautiful big curves of our windows, sometimes building up the flares with extra plaster until the shape of the curve was formed to our liking. This is also the layer into which any sculptural work can be done, which we all know is the best part of natural plaster and cob. Nana enjoyed contributing her artistic sculptural skills around the house. 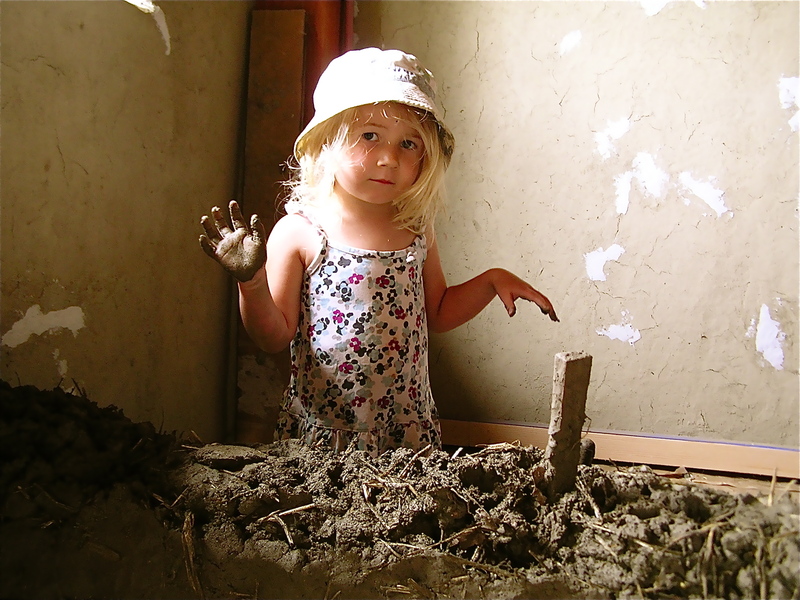 I was much more careful about who I invited to help with this layer- I mostly took it on myself (although Taeven and Cedar both took on their own ways of plastering with the trowel so they could help out). I had the help of a few friends who are artists (good hand-eye co-ordination) and who helped with the previous layer, so they had an idea of what the result was to be and they came many times to help, building up their experience of working with the plaster. My own abilities changed so much with this layer as I worked around the house, that I have re-plastered much of the first area I started on, seeing flat spots on window curves and too much cracking in other places. 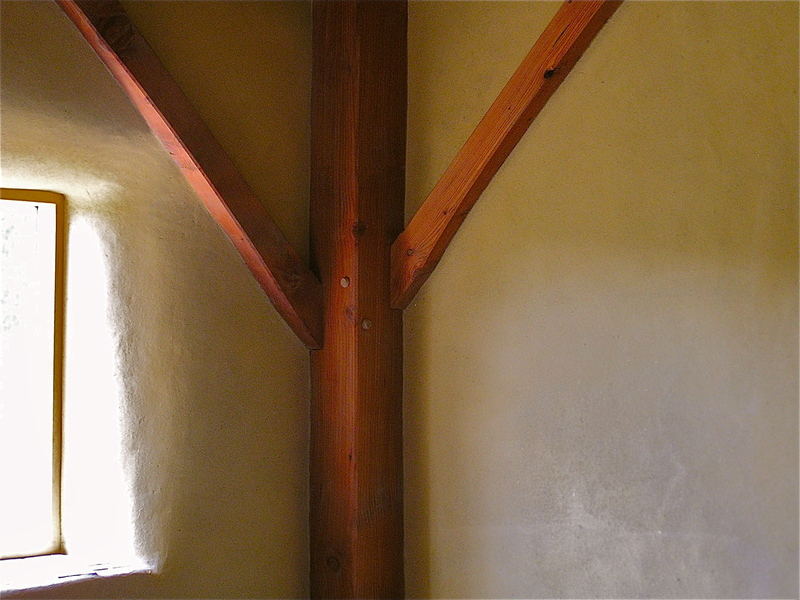 We also covered some of our interior walls with plaster. In the mud room, we built a stud frame wall, then stapled expanded metal lath to the sides, filling in the middle with straw. The plaster goes straight on the metal, in two layers to avoid any movement of the mesh beneath. The final layer of plaster is yet to be applied, and will undoubtedly require a whole new lesson in natural plaster. The outside will be a mix of lime, sand, and colour pigment, the inside coat uses finely powdered cayolin clay as its base. We fine-tune the quality of our trowels with Japanese trowels. There is more technique involved in applying the plaster to avoid lines showing up… I am looking forwards to working with Tracy again to learn this new skill level of natural plastering. 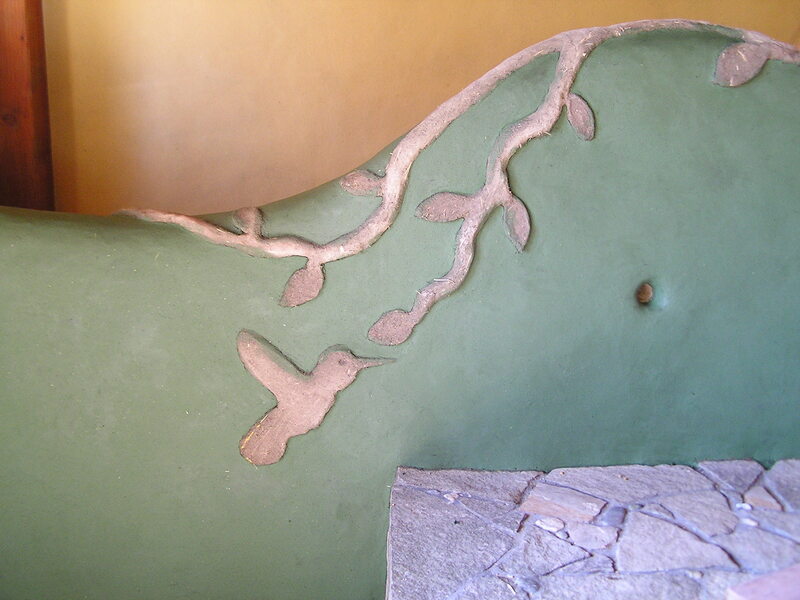 The journey of using natural plaster on our walls has been long and enjoyable, I have massaged every inch of our house with friends, conversation, children, family, quiet musings, music, meditation, in the sun and the rain. I have mixed every batch of plaster with the energy of my feet and legs, and with the soles of friends.